The landscape paintings mainly concentrate the ideal natural beauty. Traditional Chinese painting of mountains and waters will surely satisfy travelers who love Chinese cultural and arts. The beautiful mountains and waters in Guilin have attracted many famous artists since the Song Dynasty (907-1279). Modern artists like Xu Beihong, Huang Binhong, Li Keran, Qi Baishi, etc, all created precious works after visiting Guilin. Guilin galleries are not only famous locally but throughout China. 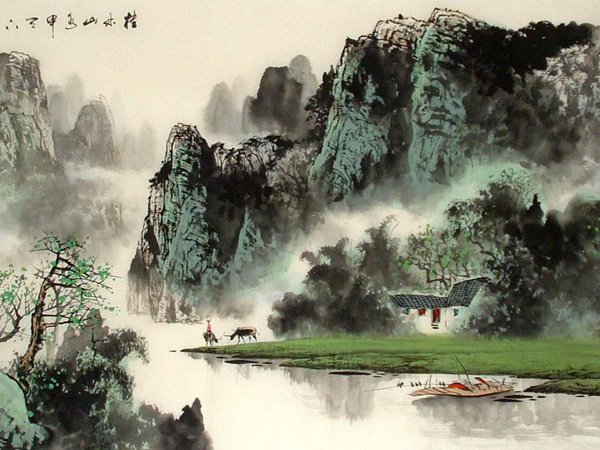 Landscape paintings of Guilin present you the highlights of the water and hills on paper, such as the foggy Li River, lifelike Elephant Trunk Hill, and Moon Hill, all of which can take away your annoyance while enjoying them. Some masterpieces can be found among these paintings in the art galleries.